Over the past few weeks, there has been a lot of news of two-wheeler manufacturers introducing CBS and ABS on their products. This move comes in light of the new regulation that makes CBS and ABS mandatory on all vehicles up to 125cc and above 125cc respectively. This rule will come into effect from 1st April 2019. In light of the upcoming norm, manufacturers have started introducing CBS and ABS-equipped versions of their current products. The latest to join the bandwagon is Aprilia and Vespa. The Aprilia SR125 has been launched at around Rs 69,250 for the CBS version. This price is roughly around Rs 3,000 higher than the non-CBS version. The SR150, on the other hand, now comes with ABS and starts at Rs 80,850 for the standard model. As is the case with the standard model, the ABS versions of the SR150 Race and Carbon demand a marginal premium. Deliveries of both these offerings have commenced, but dealers are currently getting few units to start with. Piaggio has also introduced CBS and ABS in the Vespa models. The Vespa 150s have been priced at Rs 98,310 for the VXL variant, Rs 1.02 lakh for the SXL trim and Rs 1.08 lakh for the Elegante. The CBS equipped Vespa demands Rs 88,250 and Rs 91,450 for the VXL and SXL, respectively. 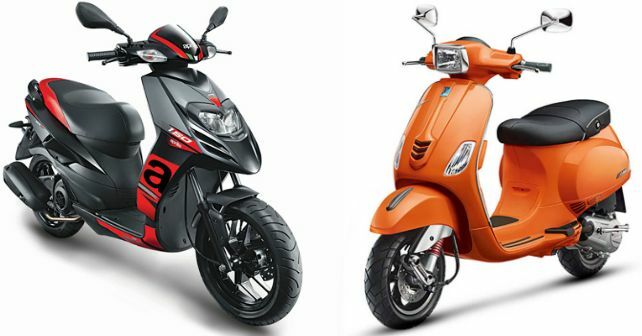 Bookings for the Vespa 125 and 150 have already commenced and deliveries are likely to start in the first week of January. While manufacturers are preparing CBS and ABS version of their products, the versions without them are likely to fetch you a small discount. Currently, certain Aprilia dealerships are offering a discount of Rs 3,000 on the SR125 without the CBS. Expect the discounts on these to go higher as the 1st April deadline comes closer. All prices mentioned here are ex-showroom Mumbai.